DECONGESTANTS SHOULD NOT be given to children under the age of six and given with caution to children under 12, experts have said. New research shows there is no evidence that they alleviate symptoms such as a blocked or runny nose, and their safety is unclear. In a report published in the British Medical Journal during the week experts advise doctors to reassure patients that while a cold can be distressing, symptoms should pass in a few days. The common cold is usually caused by viruses and is mostly self-limiting (symptoms generally clear in seven to 10 days) but it can have a substantial impact on work, school, use of health services, and money spent on medications. 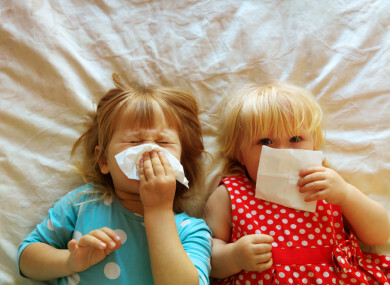 Children have around six to eight colds per year and adults have two to four, the research notes. Professor Mieke van Driel and colleagues from the University of Queensland in Australia analysed published evidence on the effectiveness of treatments for the common cold. For adults, the evidence suggests that using decongestants alone, or with antihistamines or analgesics, for a maximum of three to seven days can have a small effect on nasal symptoms. However, side effects can include an increased risk of insomnia, drowsiness, headache, or stomach upset – and long-term use of decongestants can lead to chronic nasal congestion, which is difficult to treat. The research notes that paracetamol and anti-inflammatory drugs (NSAIDs) are sometimes prescribed for pain relief, but they do not appear to improve nasal congestion or a runny nose. Other treatments, such as steam inhalation, echinacea, vapour rub, eucalyptus oil, and increased fluid intake, are either not effective or have not been studied at all. Trials are also lacking for children, especially those under the age of 12, the age group most likely to suffer from common colds. The report states that there is no evidence that decongestants or medicines containing antihistamine alleviate nasal symptoms and “they can cause adverse effects such as drowsiness or gastrointestinal (stomach) upset”. In children under the age of two such products have been associated with convulsions, rapid heart rate and death. None of the other commonly used over-the-counter and home treatments, such as heated humidified air, analgesics, eucalyptus oil, or echinacea, are supported by adequate evidence, the researchers add. Finally, the report notes that ongoing research is unlikely to provide relevant evidence or address the uncertainty surrounding treatments for the common cold. “Based on the currently available evidence, reassurance that symptoms are self-limiting is the best you can offer patients, although short-term use of decongestants in adults can provide some relief from a blocked nose,” it states. Email “Decongestants 'should not be given' to young children with colds”. Feedback on “Decongestants 'should not be given' to young children with colds”.